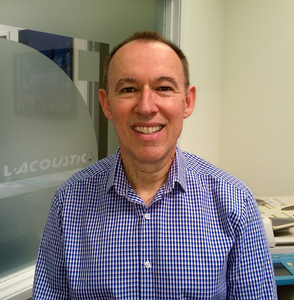 I am currently in my 11th year at L-Acoustics as a member of the Install Applications team. Our systems include large to compact line source array systems, point source products, and network controlled amplification and are used for Theatre, Themed entertainment, Worship and major Sports venue applications. No two rooms are ever the same therefore detailed system modeling, accurate acoustical measurements and application specifics are essential elements in establishing suitable design options. I work closely with AV design consultants and L-Acoustics Certified Provider network to help advance L-Acoustics growth in the commercial sound market in the US. We provide design assistance and high level client support as a requirement and I enjoy working with some very talented people both inside and outside of our company. Electronics engineering and project management experience have given me a more complete understanding of audio systems, from design and development through sales and implementation. I enjoy the opportunity to work on both project development and technical design; both are very interesting to me. End-users and sound designers have specific needs, and systems must be priced competitively and must have a supporting educational and technical service component to be viable.